My Neopets look up as I walk in, each smiling and waving hello before turning back to their game. I walk over and sit on the couch behind them, emptying my Reusable Altador Cup Grocery Bag onto the couch beside me, revealing a small gift for each of them. I wait patiently for their attention and watch as they play. When the game is finished, they turn and look to see what I’ve brought them. For Michael and Kehtry, I’ve brought them a Spotted Mynci Backpack and Mootix Backpack, respectively; they’ll be leaving for boarding school in Terror Mountain tomorrow, and of course I want them to be prepared. For Febow, the baby, who is too young to attend boarding school, I’ve brought a Cuddly Yoyo for his collection. 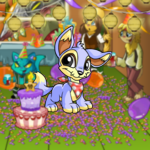 They each accept their gift gratefully, and the two older Neopets return to their bedrooms to fill their backpacks with their school supplies. Febow, on the other hand, plays with the yoyo off to the side, testing its spin, the strength of the string, and a host of other qualities he has trained himself to identify in a yoyo. After a moment, he looks up at me. “Thanks, Mum!” He smiles brightly, walking back to his own bedroom to place it with the rest of his collection. I smile, watching as he walks away, then walk quickly to my own bedroom. I sit on my bed and turn my attention to my Calendar Planner, which is sitting on the end table. I flip through it to Febow’s birthday---only a few days away. I already know what I’m going to get him: a Gold Shoyru Yoyo, one he’s been looking at for quite some time but could never save the four hundred thousand neopoints for on his own. I close my Planner, thinking about work: the Stock Market has been going my way lately; all I need to do is sell, and I’ll have more than enough for the yoyo, with thousands left over. I sigh contently, lying back on my bed, smiling to myself and thinking about the look on Febow’s face when he’ll open his gift. Febow chuckled, then walked back inside, playing with the yoyo. I wait for the neositter to arrive before leaving for work, humming brightly to myself as I walk down the street to the Stock Market headquarters. “Aren’t they, though?” I smile, walking back toward my cubicle to look over what I had just been given. Spreading out the papers on my desk, I quickly scan my own portfolio before scanning current stock prices for all companies. I am about to turn to the news stories when something---or rather, the lack of something---catches my eye. One of my main investments isn’t mentioned on the list of current stock prices. I look the list over again, closer this time, to see if I had missed it. No, it still isn’t there. “This must be a mistake....” I shake my head, looking over my portfolio again to make sure I hadn’t imagined the company. There it is. I sigh impatiently. Nigel must have make a mistake. That Chia would forget his head if it weren’t firmly attached to his shoulders. “I wouldn’t play about that.” Marie shakes her head again. Not knowing what else to do, I nod, and trudge slowly toward the door. What am I going to do? Febow’s birthday is tomorrow, and I’m short two million neopoints. There is absolutely no way I’ll be able to come up with enough for the Gold Shoyru Yoyo now. As I walk slowly home, trying desperately to think of what to do now, I can’t help but think of the look on Febow’s face that I had imagined last night, which, of course, doesn’t help me at all. It simply makes me want to cry at the disappointment of not seeing the face actually happen. As I reach home, I fumble in my bag for the key. I try one, then a second, then a third, none of them fitting. Finally, with the fourth key, I push the door open, dripping onto the wooden hallway floor. Febow and the neositter both look up from the Destruct-O-Match Chess Game. “You’re home early.” The neositter stands, waiting patiently. “It’s all good.” She shrugs, accepting the payment, and rushes out into the rain. I look over at Febow, who stands and hugs me, delighted. Then he pulled away and frowned. “I broke my yoyo today,” he said sadly, looking over to the two pieces of plastic and pile of string laying together on the floor. There is something about the look on his face as he turns and walks out of the kitchen, playing with the yoyo. He’s smiling much wider than usual, unlike any smile I’ve seen from him before. His eyes are lit up much lighter than usual, and his excitement with the yoyo is greater than I’ve ever seen before. It makes me smile to see him; and I smile even wider as I realise how much his reaction resembles the one I had imagined last night, the reaction when he would see the Gold Shoyru Yoyo. I can’t help but chuckle slightly to myself as I follow him back into the next room, where he is setting up a new game on the Destruct-O-Match Chess Game. He looks up at me and invites me to play. I sit across from him, and make the first move.